This email is sent only to subscribers.� To subscribe or unsubscribe, email NatPernick@Hotmail.com, indicating subscribe or unsubscribe to Case of the Week.� There is no charge.� We do not sell, share or use your email address for any other purpose.� We also have free email subscriptions for Pathologist/PhD jobs (biweekly), Other laboratory jobs (biweekly), website news (monthly) and new books (monthly).� Email us to subscribe. We now has over 20,000 image links, from free full text journals or websites, the AFIP fascicle third series, or contributed images.� Click here to learn how to contribute images.� We are currently updating half of the Soft Tissue Chapter, with information from Rosai, Sternberg, the WHO Soft Tissue Monograph, the AFIP Soft Tissue Fascicle third series, major pathology journals and other relevant literature.� We hope to have it completed by mid April.� Don�t forget to fill out our brief Survey (click Here or at the bottom of the Home Page) by 30 April 2008 to help us improve our website and qualify for our drawing of two prizes of $75. We thank Dr. Jerad Gardner, The Methodist Hospital, Houston, Texas (USA) for contributing this case. 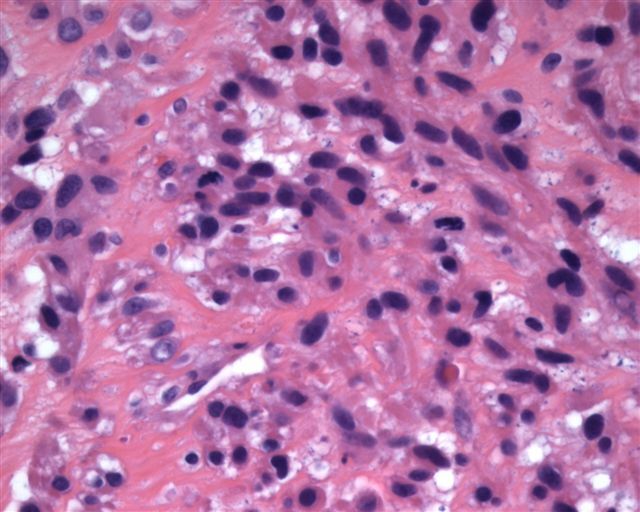 To contribute a Case of the Week, email NatPernick@Hotmail.com with the clinical history, your diagnosis and microscopic images in JPG, GIF or TIFF format (send as attachments, we will shrink if necessary). �Please include any other images (gross, immunostains, etc.) that may be helpful or interesting.� We will write the discussion (unless you want to), list you as the contributor, and send you $35 (US dollars) for your time after we send out the case.� Please only send cases with high quality images and a diagnosis that is somewhat unusual (or a case with unusual features). 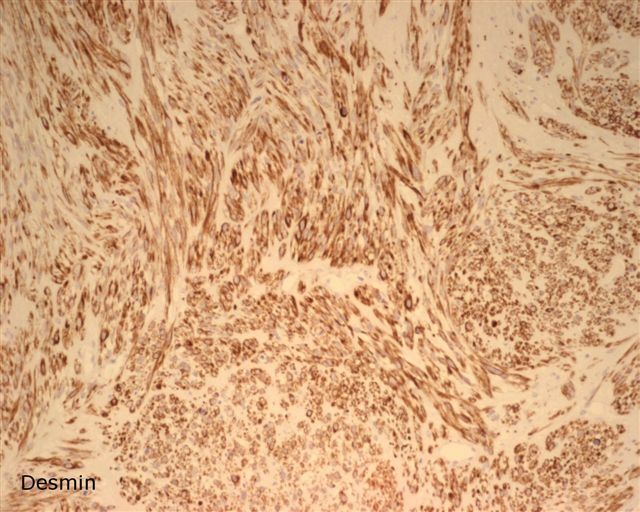 A 47 year old woman had a left ventricular mass, which was excised.� There was no prior history of malignancy. 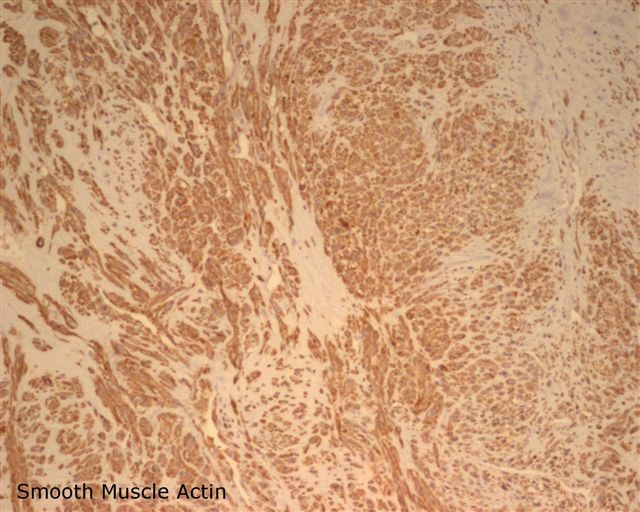 The diagnosis was confirmed by desmin and smooth muscle actin immunostains, which were positive. 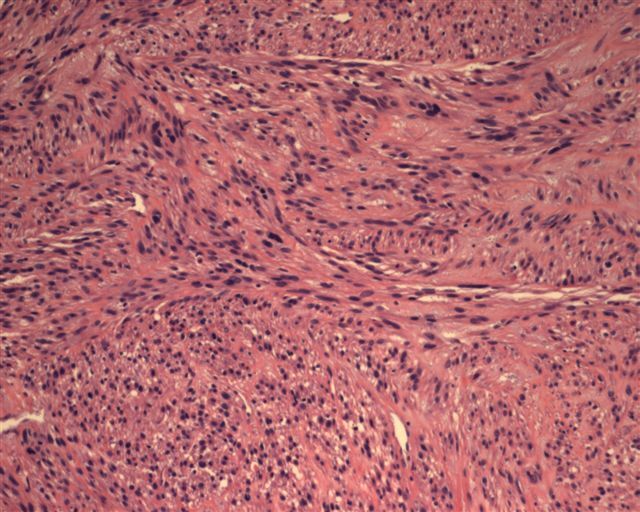 Leiomyosarcomas account for 8% of cardiac sarcomas, and often occur in patients in their 30�s.� They may arise from smooth muscle of pulmonary veins and arteries and spread into the heart, which can often be documented (Heart Lung Circ 2005;14:121).� They are also associated with Epstein Barr virus infection in cardiac transplant recipients or AIDS patients (J Heart Lung Transplant 2007;26:944). Grossly, as in this case, these tumors often resemble a myxoma (Can J Cardiol 2001;17:331).� Most (75%) occur in the left atrium, but may appear to arise from the pulmonary vein.� Thirty percent are multiple.� Microscopically, they resemble classic leiomyosarcoma with compact bundles or fascicles of spindled or epithelioid smooth muscle type cells, intracytoplasmic glycogen, blunted nuclei and moderate to marked pleomorphism.� There is usually necrosis and mitotic activity.� Occasional tumors are low grade with low mitotic activity.� PAS highlights the intracytoplasmic glycogen, and trichrome staining highlights the longitudinal fibers.� Actin and desmin are usually positive. 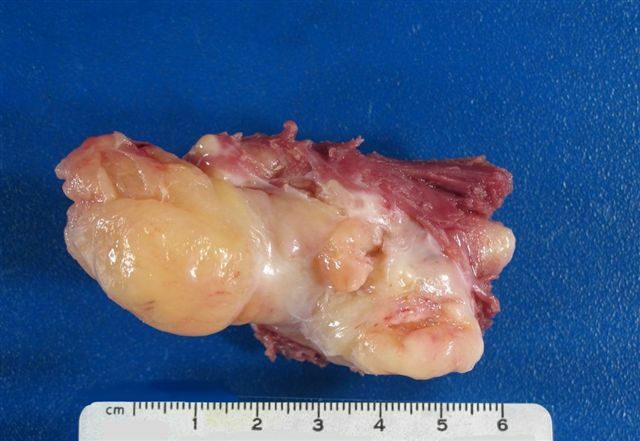 The differential diagnosis includes fibrosarcoma, which has tapered not blunted nuclei, lacks intracytoplasmic glycogen and pleomorphism, and does not stain for actin or desmin.� One must also consider metastatic leiomyosarcoma, particularly from the uterus (Clin Transl Oncol 2006;8:375), or even intravenous extension of tumor (Ann Thorac Surg 2007;84:644). 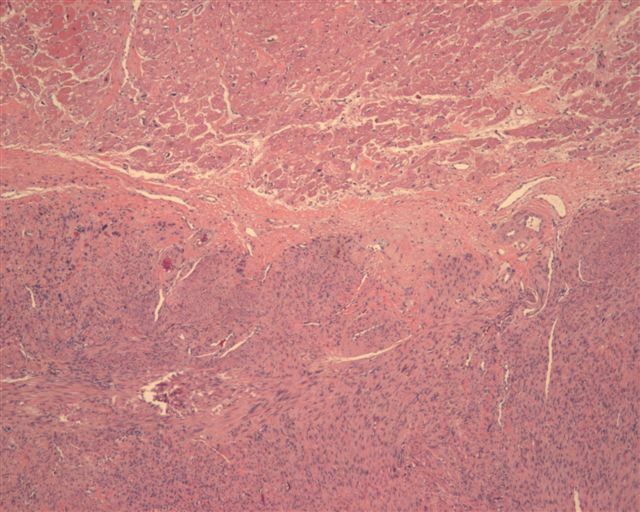 Treatment is excision or transplantation (J Heart Lung Transplant 1998;17:1133).� Prognosis is usually poor, unless the tumor is low grade (Histopathology 1999;34:295).